As today is World Book Day, I thought I would share the fictional railway books I recommend. All of the books listed here are absolutely fantastic, and I have them on my bookshelf in my University dormitory room, so they get my seal of approval. Tale of the Unnamed Engine’ is a fantastic book, an absolute delight, and reminded me of my first visit to a heritage railway, and seeing steam locomotives at such a close range. This is one of the books I can’t wait to read it to my children. But where this book shines is that is it aimed at children, but adults are never bored because of its excellent writing style. The artwork by Dean Walker is exceptional, and fits the story with every page. I wait in anticipation for the next book, Simon AC Martin, and I will know you will not disappoint. 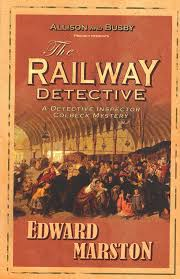 My next recommendation is a murder mystery series, the Railway Detective, by Edward Marston, based around the adventures of Detective Inspector Robert Colbeck, and Sergeant Victor Leeming, and they are always a fantastic read. What makes these an excellent series is the use of actual railway lines in the 1850s, the views of the population on the railways, and the always available, Bradshaw’s Guide. Each books links with each other, and the series is now has 10 books, with the 11th edition coming out in April. 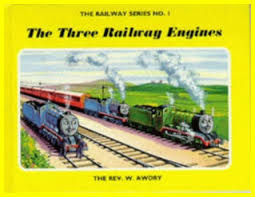 Of course any railway book article is without mention to the original Railway stories, by the Rev. W Audrey, and I still have them all in my attic, ready for the day when they are needed again. The books have a certain charm, that apart from Simon AC Martin’s book, have never accomplished by other railway books aimed at children, and what ever your views on the Thomas series now, they harken back to the time when railways had a certain romance about them, and children lined the platforms to catch the number of every locomotive that passed through. 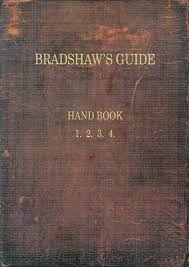 And, in the chance that they might not be your cup of tea, you could always read a Bradshaw’s Guide, and go on a Great British Railway Journey! While I’ve not really read any of the other series I have read all but the 3 most recent Railway Detective novels and totally share your enthusiasm for them and would suggest trying Andrew Martin’s “Jim Stringer” railway detective novels too as mentioned by Simon. There are noticeable differences, mainly the change of viewpoint from 3rd person narrator to 1st person, the time period being Edwardian rather than Victorian and a somewhat earthier(?) storyline. Apart from those fairly subtle differences the two series are equally entertaining. I got to admit the earlier books are better when “Jim Stringer” is a railwayman rather than the detective but they are all very good and have read the entire series. Had a look on Amazon, and will purchase them later in the year. Probably make the list next year! 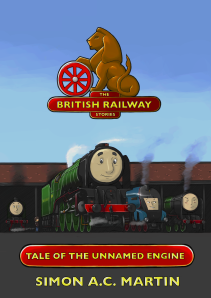 I would defiantly purchase Tale o the Unnamed Engine. Even though it is a children’s book in concept, it is great for adults as well. Dean’s artwork is fantastic, and Simon’s storytelling is perfect. Probably what rates it so highly on my list is that it is signed by Simon AC Martin himself!